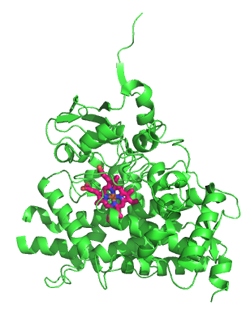 Human Cytochrome P450 CYP17A1 PDB. Cytochrome P450 17A1, or steroid 17-alpha-monooxygenase, or 17α-hydroxylase/17,20 lyase/17,20 desmolase is an enzyme that in humans is encoded by the CYP17A1 gene. It is found in the zona reticularis of the adrenal cortex. This gene encodes a member of the cytochrome P450 superfamily of enzymes. The cytochrome P450 proteins are monooxygenases that catalyze many reactions involved in drug metabolism and synthesis of cholesterol, steroids, and other lipids. This protein localizes to the endoplasmic reticulum. It has both 17alpha-hydroxylase and 17,20-lyase activities, and is a key enzyme in the steroidogenic pathway that produces progestins, mineralocorticoids, glucocorticoids, androgens, and estrogens. 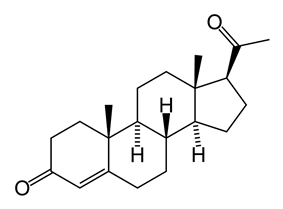 More specifically, CYP17A1 acts upon pregnenolone and progesterone to add a hydroxyl (-OH) group at carbon 17 of the steroid D ring (the hydroxylase activity), or acts upon 17-hydroxyprogesterone and 17-hydroxypregnenolone to split the side-chain off the steroid nucleus (the lyase activity). Mutations in this gene are associated with 17 alpha-hydroxylase deficiency, 17 alpha-hydroxylase/17,20-lyase deficiency, pseudohermaphroditism, and adrenal hyperplasia. The drug abiraterone which is used to treat castration-resistant prostate cancer blocks the biosynthesis of androgens by inhibiting the CYP17A1 enzyme. Abiraterone binds in the active site of the enzyme and coordinates the heme iron through its pyridine nitrogen, mimicking the subtrate. 17α-hydroxylase converts pregnenolone and progesterone to their 17-hydroxy forms, and converts 17-hydroxypregnenolone and 17-hydroxyprogesterone to DHEA and androstenedione, respectively. It corresponds to the downward arrows in this reaction scheme. Steroidogenesis, showing, at left side, both reactions of 17-alpha hydroxylase, and both actions of 17, 20 lyase. ^ Boulpaep EL, Boron, WF (2005). Medical physiology: a cellular and molecular approach. St. Louis, Mo: Elsevier Saunders. p. 1180. ^ "Entrez Gene: CYP17A1 cytochrome P450, family 17, subfamily A, polypeptide 1". ^ ​; DeVore NM, Scott EE (Feb 2012). "Structures of cytochrome P450 17A1 with prostate cancer drugs abiraterone and TOK-001". Nature 482 (7383): 116–9. Miura K, Yasuda K, Yanase T, Yamakita N, Sasano H, Nawata H, Inoue M, Fukaya T, Shizuta Y (Oct 1996). "Mutation of cytochrome P-45017 alpha gene (CYP17) in a Japanese patient previously reported as having glucocorticoid-responsive hyperaldosteronism: with a review of Japanese patients with mutations of CYP17". The Journal of Clinical Endocrinology and Metabolism 81 (10): 3797–801. Miller WL, Geller DH, Auchus RJ (1999). "The molecular basis of isolated 17,20 lyase deficiency". Endocrine Research 24 (3-4): 817–25. Strauss JF (Nov 2003). "Some new thoughts on the pathophysiology and genetics of polycystic ovary syndrome". Annals of the New York Academy of Sciences 997: 42–8. Haider SM, Patel JS, Poojari CS, Neidle S (Jul 2010). "Molecular modeling on inhibitor complexes and active-site dynamics of cytochrome P450 C17, a target for prostate cancer therapy". 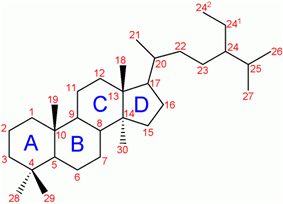 Journal of Molecular Biology 400 (5): 1078–098.